Copyright 2006 Michael Chu (via iStockPhotos). Allahabad, Jan 15 (IANS) — Tens of thousands of pilgrims – that included dozens of foreigners – looked on with folded hands at the naked Naga sadhus, the first to take the holy dip long before the sun’s first rays dawned, as they went past in long, colourful processions with a brass band in attendance. The Naga sadhus as well as the saffron-clad hermits raised their hands to bless the devotees who had waited for hours to have a glimpse of what is believed to be the royal entourage of the gods. Hindus believe a dip in the confluence of the Ganga, Yamuna and the mythical Saraswati will not only wash away one’s sins but also help achieve the ultimate goal of divine salvation – more so during the auspicious Kumbh festival that began Jan 3. “Nearly seven million people had bathed until 5 p.m. on this extended period of the popular Makar Sankranti festival,” a local official told IANS. A tourist from Malaysia remarked that the numbers that took a bath was nearly double the population of Singapore. But the day belonged more to the privileged and highly revered ‘akharas’ (Hindu monasteries) of which the Naga sadhus form the most prominent and integral part. The first to march out of their camp were sadhus of the Maha Nirvani Akhara who arrived at Sangam at 6.15 a.m., took joyous dips in the ice cold water, and strictly adhered to their time slot of 40 minutes. Next in line was the Nirajani Akhara with a live pipe band in attendance. At the head of the bandwagon was the akhara chief posted atop an elevated seat over an improvised motorised rath (chariot). Juna Akhara, regarded the most significant, arrived in a long procession that included the largest batch of Naga sadhus, who literally raced on the sandy banks to plunge into the waters. Brandishing glittering steel swords in their hands, they raised the sacred chant of “Har Har Mahadev” that was dutifully echoed by the thousands who followed them. The Juna Akhara included a small group of foreigners and a band of women sadhus, who were equally zealous about taking the plunge in the biting cold. “A dip in these waters gives you a divine feeling. Everything else becomes secondary,” observed Mata Narmada Puri, a 73-year-old German woman sadhu of the congregation. “I gave up my German name 35 years ago when I first went to Haridwar to become a part of the Juna Akhara,” Puri told IANS. Her 62-year-old companion Sigi Hoehle, who joined her from Germany a few days back, felt equally “blessed” by the Sangam waters. For the Naga sadhus, the dip was heavenly. 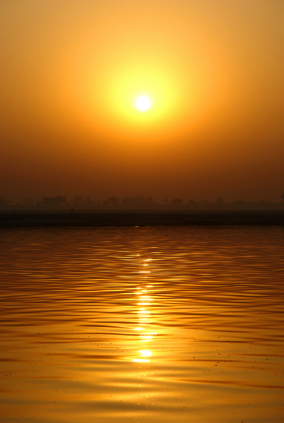 “Without a bath at Sangam during the Kumbh, I would have remained incomplete. The dip has given me a heavenly experience – after a gap of six years,” said Naga Baba Triveni Puri, as he emerged from the icy waters and smeared his naked body with ash. Among the millions who trudged miles for a holy dip were not only the old and infirm, but also the physically challenged. Forty-year-old polio-hit Ram Iqbal Singh, who came from Bihar, walked with his rickety wooden crutches right from the railway station. Living out of alms received from people, he confessed to having undertaken the journey without a penny in his pocket. “I just boarded a train and no one asked me for a ticket; I got free food at one of the many camps in the fair area. Now that I have had my dip, I will go back home,” said a satisfied Ram. The ritual looked endless as hundreds of thousands of heads dotted the sprawling vast expanse along both banks of the confluence and the flow of people continued though the day. Apart from the two days of Makar Sakranti Jan 14-15, a large number of pilgrims are expected to come here on Jan 19 (Mauni Amavasya), Jan 23 (Basant Panchami), Feb 3 (Magh Purnima) and Feb 16 (Maha Shivratri).